Heres how to install a full stainless clutch line in a 2g 4g63 dsm. Step 1: locate your master cylinder and slave cylinder. Start at the master and unbolt the clutch line. Have a pan ready to catch fluid. Start removing all of it until you get to where it separates into a soft rubber line. Step 2: Unbolt the FCU (aka fucks clutch up) from the transmission. I think there are 4 bolts. Unbolt the rubber line from the hard line and get it out of the support. Have a pan ready to catch fluid. 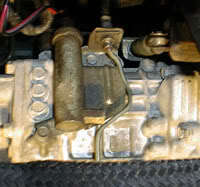 Step 3: Unbolt line from slave cylinder, have a pan ready to catch brake fluid. Step 4: Now on to the easy part. Start at the master, and bolt the line to it. Run your line however you want around the engine bay. Get creative, theres really no set way of doing it. Step 5: Bolt the other end of the line to the slave cylinder. Step 6: Get a clutch buddy, fill the reservoir up, and bleed the clutch. Look for any leaks.